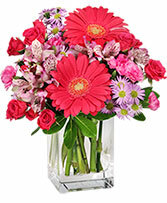 Roses, Carnations, Chrysanthemums And Asters Arrive In A Glass Vase With A Keepsake Bear, Approximately W X H.
Too cute--this enchanting bouquet will let that special someone know you think they are as sweet as can be! 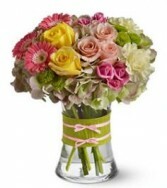 A keepsake bear hugs a bouquet of pink roses, lavender mums, and pale yellow snapdragons - what could be more adorable? 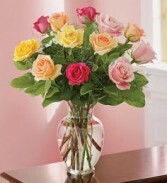 Twelve Mixed Roses With Waxflower, Eucalyptus And Plumosus In A Classic Glass Vase.